A 10-week course of 2 hours each week full of fun and rapid learning. In this course participants will be taught how to read and write the commonly used Chinese radicals which still form the basis of modern Chinese writing. By mastering these radicals, students will learn other ideographs more easily and how to use a Chinese/English dictionary more quickly. Students will also learn to converse in everyday situations. 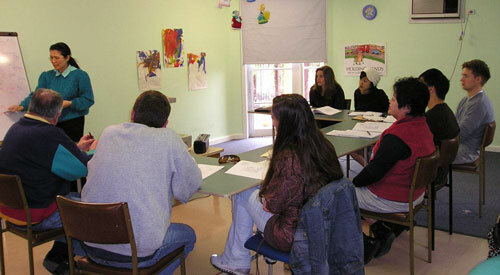 The approach used to teach writing reading and conversing is based wholly on accelerated learning principles. Chinese writing has no alphabetical order therefore it is difficult to remember the ideographs through memorisation, since there are no sequential links connecting them. There are 214 elementary pictographs that form the basis of Chinese writing. These pictographs originated literally from pictures drawn of objects, animals, phenomena of nature etc. These pictures have changed over the years but many can be identified from their original representations eg. The word for "human being" is which is Chinese character for man. These pictographs evolved over the centuries of Chinese civilisation into symbols that stand for abstract ideas. Thus simple pictographs evolved further into ideographs. Gradually ideographs were combined with a kind of phonetic script to make new words. The Chinese language is constantly evolving and there is an infinite number of words that can emerge through the combinations of the 214 elementary pictographs called 'Chinese radicals'. Alternatively a new word can be formed by combining two or more radicals. And this is only the beginning. Such is the genius of Chinese writing. What is Accelerated Learning (Suggestopedia)? Recognised by UNESCO as one of the best approaches for the teaching of a foreign language, accelerated learning or suggestopedia is the brainchild of Dr. Georgie Lozanov, a Bulgarian doctor and psychotherapist. When taught with suggestopedic methods, Dr. Lozanov's students' learning rate was five times greater compared to normal teaching methods. Accelerated Learning is an integrated system of learning which stresses that people learn better:- - when combining their conscious and unconscious mind - under conditions of relaxation, pleasure, fun, play & games - when their self esteem is not threatened - when their teachers are knowledgeable about the subject - when the teacher uses a multi-sensory holistic approach (whole brain). Watch the video to find out how we apply Accelerated Learning in teaching Chinese Mandarin. Accelerated Learning Techniques result in better retention and recall of materials. Students' confidence and motivation also increases as they learn. We have 20 Levels of classes starting from Level 1 (Beginners) to Level 20 (Advance). Each Level of classes is 20 hours (i.e. 10 classes of 2-hour duration). If you have studied Chinese previously, feel free to contact us to find out which Level is suitable for you. Check out our Course Syllabus here. We also specialise in in-house company classes. We can tailor our language courses to suit your corporate needs. It is more cost effective than you think! Our customer list includes ANZ Bank, Cadbury Scwheppes, Sealrocks, Omicron, Hella Aust, Thales ATM, JeansWest, Mallesons Stephen Jaques, Crown Casino and many more.